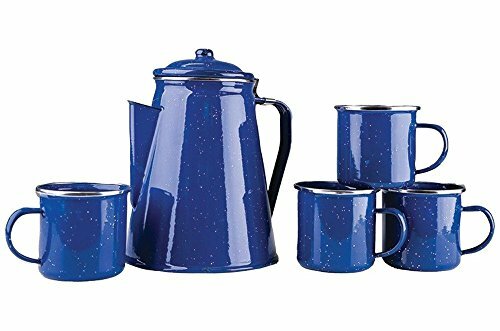 Enjoy a cup of your favorite hot beverage with the Stansport Enamel 8 Cup Percolator Coffee Pot with 4 Mug Set. An enameled surface includes a sturdy handle. The four matching mugs and percolator are both chip-resistant. Includes coffee pot and four 12 oz. cups. Kiln-hardened enamel prevents chips. Stainless steel accents. Classic blue finish. Pot holds up to 8 cups.